1. Select the Database => Server: LAN menu. AnyLexic will start searching for the machines available in the LAN. 2. Select the machine, where your AnyLexic 2.0 Server is installed. Some of your network settings may not allow AnyLexic to obtain the list of your local PCs. 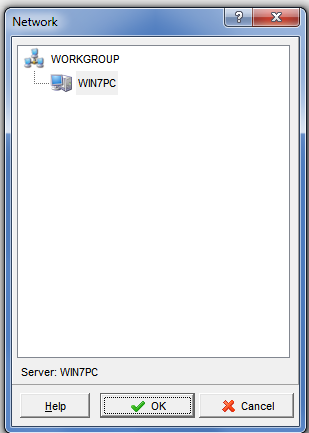 In this case, please enter the network name of the Server PC manually. 3. Enter the login and password granted to you by the server administrator. 1. Select the Database => Server: Internet menu. 2. Enter the external IP-address of the machine where your AnyLexic Server is installed. For both cases, AnyLexic Server can be blocked by firewall software. Make sure that port 3050 is open on the AnyLexic Server PC, and that the AnyLexic and AnyLexic Server Administrator software are included into the trusted programs list of your firewall.